I was an easy sell. When I first met Rob Davies, the marketing manager for Indiana Farmers Union, in late 2016 at a local coffee shop in Danville, Indiana, it took him about 15 minutes to sell me on a Farmers Union membership. The irony: I was there to sell him advertising for a farm publication that I edited. It wasn’t supposed to be him selling me on anything. But within those first few minutes, as he described the mission and purpose of Farmers Union, I knew I had to join—if for no other reason than to support the work that the organization does. Indiana Farmers Union works to protect and enhance the economic well-being and quality of life of family farmers. That’s part of its mission statement. But it does so much more. Indiana Farmers Union, and its parent organization National Farmers Union, supports and encourages local and regional food systems. It represents family farmers and consumers on issues such as energy and food security, agriculture sustainability, rural development, and environmental conservation. It stands against monopolies in our food system, and it advocates for truth in labeling, competitive markets, a level playing field, and access to markets for our family farmers. Farmers Union educates farmers on issues such as food safety, and it supports and encourages the development of cooperative businesses. Memberships for Indiana Farmers Union cost $50 a year. That didn’t seem like a lot for me to give. I was in. I returned to my desk at work and signed up. And it was the best $50 I ever spent. Here’s a little of what’s changed since then. 1. I found my people. For full transparency, I work for Indiana Farmers Union now. A couple months after first meeting Rob, I found myself working alongside him. He isn’t just a marketing manager for Indiana Farmers Union, but also works in several states throughout the region. He needed help in Indiana, and I had found my new calling. Since making the switch, I’ve had the opportunity to meet the staff of National Farmers Union and most of its Board of Directors, both of which are made up of farmers and food advocates of all ages and stages. They offer a wealth of knowledge, Union history, government relations background, and more to me as I go about my work. My learning curve has been an incredible journey. Then there are the other farmers and advocates from all over the country. They’re running for offices (or have held offices). They’ve founded female farmer networking groups. They have founded and manage national organizations. They work tirelessly on state and national levels to promote and encourage humane animal agriculture, environmental sustainability, and fair playing fields for American family farmers. They are my people. I’ve also met a good number of our state’s legislators, and I now have the opportunity to work more closely with Indiana’s amazing farmers. When you join Farmers Union, you have the opportunity to network like crazy. It’s a little mind-blowing. 2. I found my voice. When I was a full-time journalist, I was supposed to remain unbiased. I was supposed to keep my opinion to myself. Since joining Farmers Union, I’ve had the opportunity to attend Legislative Fly-Ins with Farmers Union leaders. This is a perk offered through all of National Farmers Union’s state chapters. Each September, farmers from all over the nation are sent to Capitol Hill to meet and talk with their legislators and with U.S. Department of Agriculture (USDA) leaders. This is only one of the many ways National Farmers Union and each of its state charters gives members their voice. Farmers Union is a grassroots, democratic general farm organization. This means at every level, farmer members can vote and voice their opinions. They can tell their stories, they can stand up for what they believe in—and if we don’t all agree?—that’s ok. We learn from each other. We work together, and we take it to the Hill to get things done. National Farmers Union is the only family farm organization that has a PAC (political action committee). What this means? NFU donates funds to campaign for or against candidates, ballot initiatives, and legislation. National Farmers Union represents more than 220,000 family farmers throughout the nation, and it goes to bat for its members in the ways that really matter. There are two phrases that I’ve heard since joining Farmers Union that stick with me still. When I’m on Capitol Hill speaking for the issues that are important to me and to our state’s family farmers, I’m filled with hope. We have a system in place, and the only chance we have of getting things done is to show up and speak up. Now, I do. 3. I learned how to be a better farmer and business owner. The educational opportunities offered by National Farmers Union are incredible. Since joining Farmers Union, I’ve attended the annual Women’s Conference, and my husband, Randy, and I are finishing up the third leg of NFU’s Beginning Farmers Institute (BFI) in just a few weeks. For new and beginning farmer members, BFI is worth every penny of your membership dues. The program flies a select group of beginning farmers to three cities to take part in farm and business workshops and go on farm tours, giving them the opportunity to network with other beginning farmers and to meet some of the leaders in the National Farmers Union network. Most importantly, it is built to train Farmers Union’s next generation of leaders. Farmers Union memberships offer lots of discounts on farm supplies and gear, seeds, software, farm insurance, and even car and hotel rentals. But the educational programs and conferences are where it’s at. Each event, including the annual National Farmers Union Convention, which is coming up in early March in Kansas City, Missouri, offers members opportunities to learn from and network with agriculture experts and other farmers from all over the country. For more information on these programs, including Beginning Farmers Institute, which is currently accepting applications, head to nfu.org. 4. I am more aware. 5. I found my purpose. That seems a little depressing, but I announced at a recent chapter meeting this hard truth about my life. For years – decades, actually – I was a magazine editor. There was nothing wrong with this gig. It was a good one. It paid my bills. I used my position to help others break into the business and hone their skills as journalists, and I published stories on the people and places that made our communities great. It wasn’t bad; it often felt right. But it didn’t light any fires in me. It didn’t keep me up at night. Since joining Farmers Union and going to work for Indiana Farmers Union, I’ve felt compelled to turn this state division into something even better than what it has been. I want Indiana Farmers Union to be amazing. Every cliché comes to mind when I think about what Indiana Farmers Union can do. The sky is the limit. We can develop chapters and working groups. We can lobby our state’s legislators. We can start cooperatives, build out the Indiana Farmers Union staff, and go to work in D.C. when we need to. We can teach our members how to run for offices. We can work on food access and food justice issues in our cities and towns. 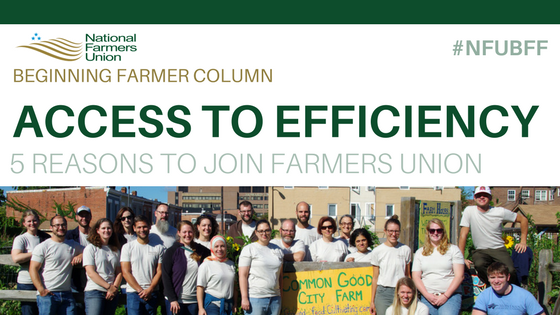 National Farmers Union and Indiana Farmers Union cares about farmers and their communities—whether those farmers are new or long-established, or urban, rural, or somewhere in-between. As farmers, union members, and union supporters, we can go to work each day to make our world a better place.